Recently I wrote how the DAP is filled with morons and gave two examples. Today,I shall give you another. 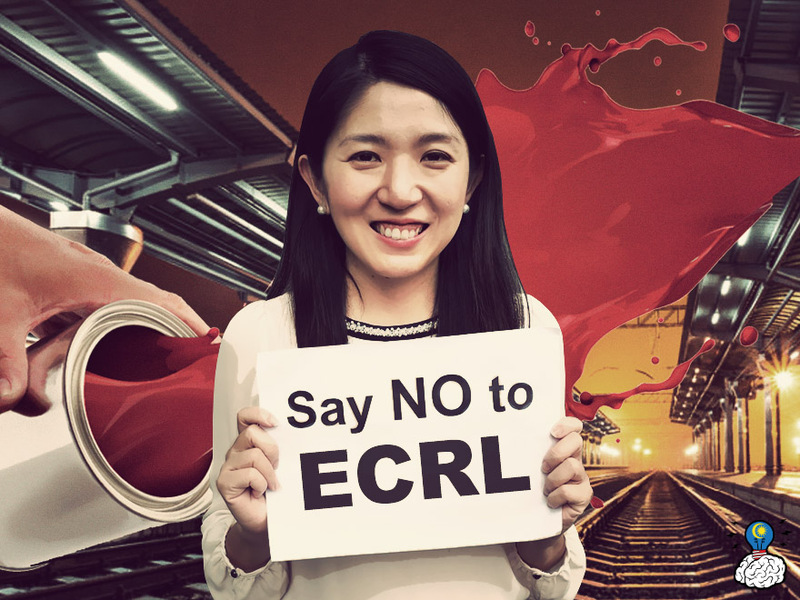 DAP’s Yeo Bee Yin said no to the East Coast Rail Link (ECRL) back in March 2017. As a matter of fact, this one other dunce from the dungu party asked Selangor NOT to help out with the ECRL project when, as she said, it could be completed at almost half the price. Those who voted her in are equal idiots or worse for letting themselves be duped by this slightly more intelligent moron. This is because she compared the cost of constructing the ECRL to the project in Tanzania where the new line will be built next to the existing line, no greenfields, and that there are no tunnels to be constructed. Being the typical drama queens, her Pakatan friends dubbed the ECRL the most expensive railway project in the world. The first phase of the ECRL will run 600 kilometers of tracks, electrified, with 50 kilometers of tunneling. The second phase will link the ECRL from the Gombak Intergrated Transport Terminal to Port Klang, a further 88 kilometers. The cost is estimated to be at RM55 billion (USD12.6 billion). This translates into about RM80 million (USD18.4 million) per kilometer. As a comparison, the Madrid-Volladoid line in Spain costs USD5.48 billion (RM24 billion) for a 177-kilometer distance which comes up to about USD30 million (RM130.4 million) per kilometre. The Bremmer rail project in Switzerland cost USD6.56 billion (RM28.52 billion) for a 55 kilometer-line or RM518.55 million per km. 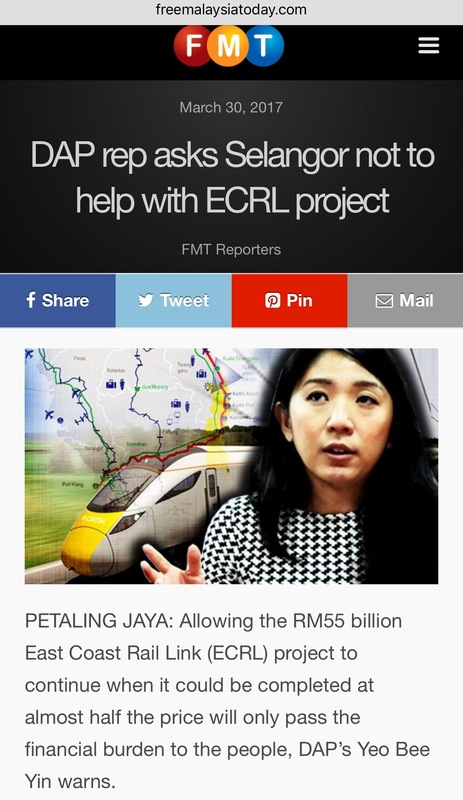 I don’t know how Yeo Bee Yin and friends could claim that the ECRL is the most expensive rail project. Then again, they also fielded a calon hantu (phantom candidate) who is an Australian citizen as a candidate in last year’s Sarawak state elections. On the benefits of the ECRL, I have written a post on that. Suddenly, out of the blue, the ECRL is a meaningful project for the people of Selangor, said Yeo Bee Yin. 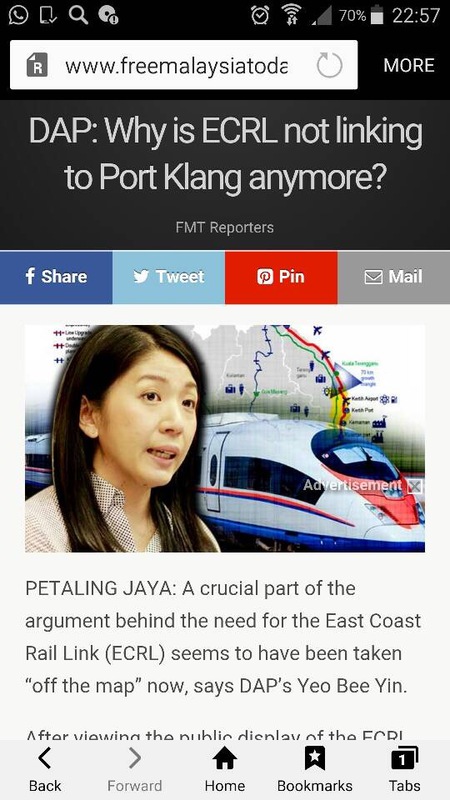 She said this when questioning why, if the ECRL is to be the land bridge connecting Kuantan port and Port Klang, is the ECRL terminating at the Gombak Intergrated Transport Terminal? She said that a crucial part of the argument behind the need for the ECRL seems to have been taken “off the map” and then insinuating that the Barisan Nasional-led government is punishing the people of Selangor by terminating the project at the GITT. She made this conclusion after viewing the public display of the ECRL at the Land Public Transport Commission (SPAD) headquarters where, according to her, only 16.7km of the Selangor portion appeared showing the route from Gombak into Pahang, but not the important segment that connects it to Port Klang. She also asked if there was an agenda by the Federal government in leaving the Pakatan Harapan-led Selangor government from the decision-making process. Which begets the question: Did the DAP-led Pulau Pinang state government include the Federal government when it decided to have a tunnel to link the island with Butterworth? Isn’t that a state government project while the ECRL is a Federal government project? Most of you would also by now ask why is the ECRL terminating at the GITT instead of at Port Klang? Remember what I wrote above not too long ago, that the first phase terminates at the GITT while the second phase connects the GITT to Port Klang? 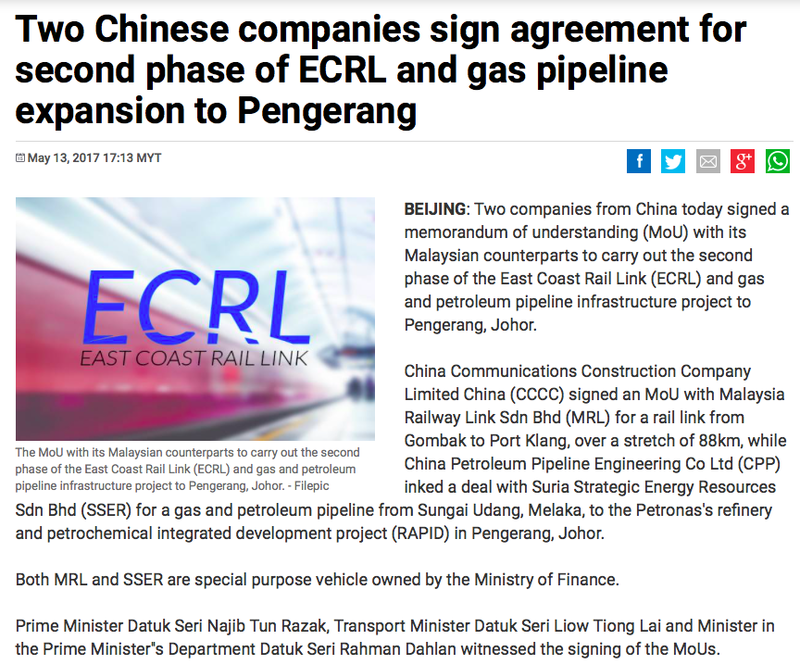 China Communications Construction Company Limited China (CCCC) has signed an MoU with Malaysia Railway Link Sdn Bhd (MRL) for a 88-kilometer rail link from the GITT to Port Klang. This is one of the reasons the Prime Minister is in China. I would like to remind Yeo Bee Yin to leave the matter for the professionals to handle. Just look into simpler matters such as why are her voters double and triple parking their vehicles at Damansara Uptown. She has been the ADUN for that area for almost one term and yet she can’t teach her voters manners and solve the traffic woes there. Or if she wants to look smart, she should ask Tokong about the RM305 million study that has yet to be submited to the Works Ministry.